BLU isn't yet a household name in the realm of smartphones, but the company has been quietly releasing hardware for the last few years, letting the remarkably low pricing do the talking. Today they've pulled the cover off of three new models, all aimed at the new "phablet" craze, or at least the lower end of it. 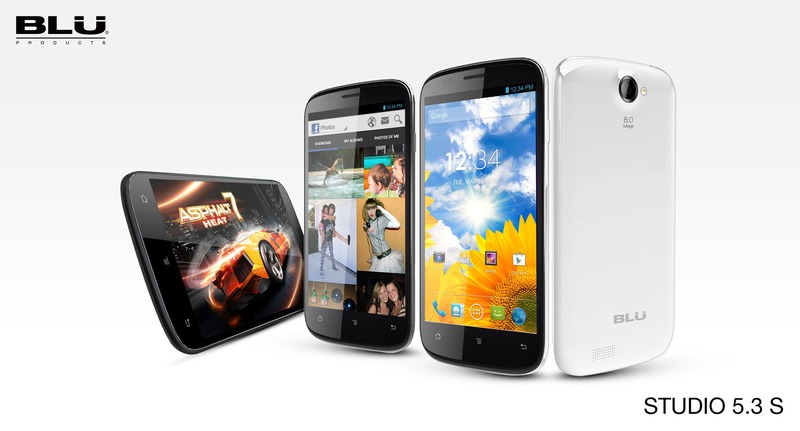 The new Studio GSM smartphones start at 5 inches and just $149, and all three feature Android 4.1, the Google Play Store, and dual SIM slots. Specs are low, but these phones look like ideal budget devices or travel companions. The Studio 5.0 is the cheapest of the lot, at $149 unsubsidized. That 5-inch screen has a low resolution at 840x400, and under the hood is a 1Ghz dual-core MediaTek MT6577 processor and Power VR SGX531 GPU. RAM is a bit anemic at 512MB - barely enough to run Jelly Bean smoothly - with 4GB of internal storage and a MicroSD card slot. The rear camera is 5MP, with a VGA cam on the front. The Studio 5.0 S moves things slightly up-market with a 960x540 IPS screen, Snapdragon S4 quad-core 1.2 GHz CPU, and Adreno 203 GPU. Storage remains 4GB but RAM is bumped up to a full gig, and the cameras get boosted to 8 megapixels for the rear and 2MP in front. Perhaps best of all, the 5.0 S slims down into an 8.9mm plastic body. 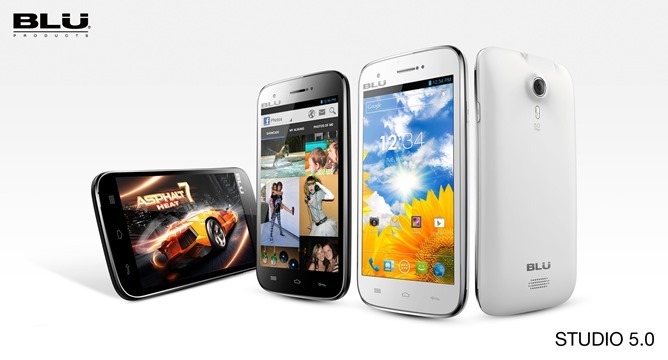 The Studio 5.3 S has identical specifications, but extends the QHD screen to 5.3 inches and the body to 9.2mm. Prices for the 5.0 S and 5.3 S start at $209 and $229, respectively; you could expect to pay $400-500 for an equivalent off-contract phone from any major US carrier-manufacturer combo. None of these phones are going to stand out among current flagships, and the low resolution screens don't hold a candle even to mid-range phones. But the prices for these devices are compelling - low enough to tempt anyone who needs an unlocked phone for prepaid service or travel, especially if you don't need LTE. According to BLU's press release, all three will be available from Amazon and other retailers starting next week. 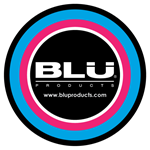 MIAMI, May 14, 2013 /PRNewswire/ -- BLU Products, one of the fastest growing mobile phone manufacturers in the world announced additions to their popular Studio Series Lineup of smartphone devices. The Studio label designates a large screen device with great battery life, including the foremost features and user experience available at each price point. The increased focus by BLU on large screen devices is due to the mounting demand by consumers for a spectacular viewing experience on their devices at entry level price points. "We've gotten to a point where, for a large part of our customer base, nothing short of a 5.0-inch screen is acceptable – it's becoming the mainstream," said Samuel Ohev-Zion, CEO of BLU Products. "Still, these devices haven't been affordable. It's embarrassing to see the tiny, low resolution displays that traditional manufacturers are offering at entry level price points. It's been a major turn off for a consumers looking to upgrade to a smartphone, sometimes, for the first time. We believe the Studio Series will accelerate smartphone adoption in prepaid markets in the US and Latin America by offering the best possible value and user experience available in the market today." The New Studio Series, all featuring Dual-SIM capability, and powered by Android Jelly Bean v4.1 are now under production with deliveries starting this week. The devices will be available unlocked at major online retailers such as Amazon.com, as well as several Pre-Paid Dealers and Agents in the US. Immediately following the US launch, the New Studio Series will be available throughout Latin America in over 30 countries, and several network operators. New to the Studio Series, is the stunning "S" Line which provides industry leading display technology such as IPS (In Plane Switching) – allowing the user to enjoy the images on the screen from any viewing angle with the same color intensity and clarity, along with OGS (One Glass Solution) – eliminating the air gap between the touch lens and LCD, resulting in a thinner device, by bringing the display closer to the user for unmatched, visually stunning images on the screen, resulting in a high end user experience only found on flagship smartphone devices. Also unique to the Studio "S" Line is the sleek design and unmatched premium build quality of the devices along with a slim profile at only 8.9mm for the Studio 5.0 S, and 9.2mm for the Studio 5.3S. The Studio "S" Line is powered by a Qualcomm S4 Play Quad-Core 1.2 GHz CPU, with Adreno 203 GPU, combined with HSDPA 3G Connectivity, 8MP autofocus camera with LED flash plus 2MP frontal camera, 4GB Internal Memory upgradable to 32GB with external memory card slot, 1GB RAM, and either 5.0" qHD 540*960 display for the Studio 5.0S, or 5.3" qHD 540*960 display for the larger Studio 5.3 S.
Retail pricing for the Studio "S" Line is starting at $209.00 for the Studio 5.0S, and $229.00 for the Studio 5.3S. Joining its bigger brother the Studio 5.3 II, which launched in February at $199.00 Retail, the Studio 5.0 is bringing new affordability never seen before for a large screen smartphone device, starting at just $149.00 Retail. 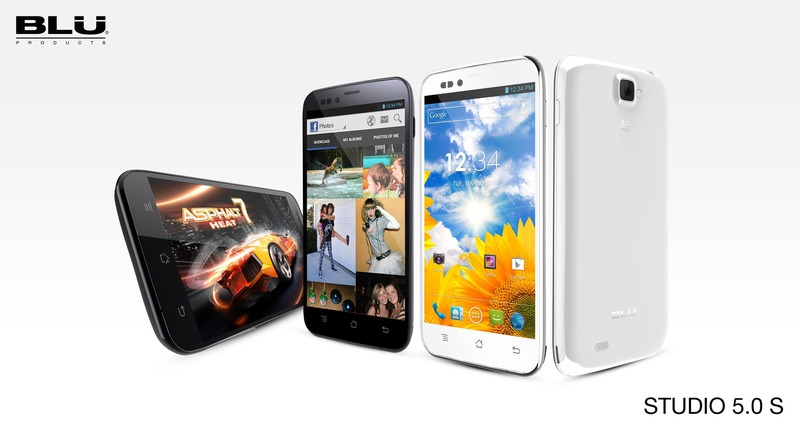 The Studio 5.0 is powered by a MediaTek MT6577 Dual-Core 1 GHz Cortex A9 CPU, with Power VR SGX531 GPU, combined with HSDPA 3G Connectivity, 5MP autofocus camera with LED flash plus VGA frontal camera, 4GB Internal Memory upgradable to 32GB with external memory card slot, 512MB RAM, and 5.0" WVGA 480*800 display.